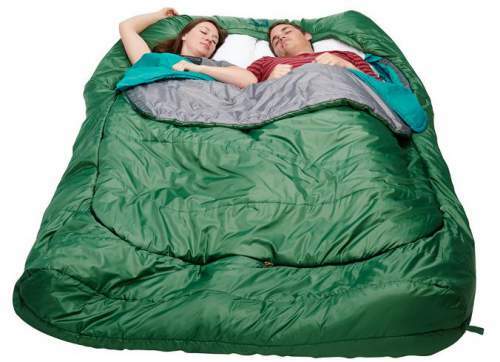 Kelty Tru.Comfort Doublewide 20 Regular Sleeping Bag is a camping bag for couples, a comfortable tool with some unique features. Those include two internal blankets and a completely removable top layer. 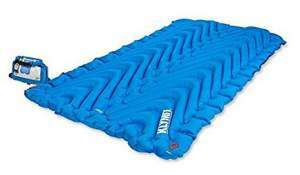 Kelty Tru.Comfort Doublewide 20 Regular Sleeping Bag top view. Unique design – two integrated blankets. 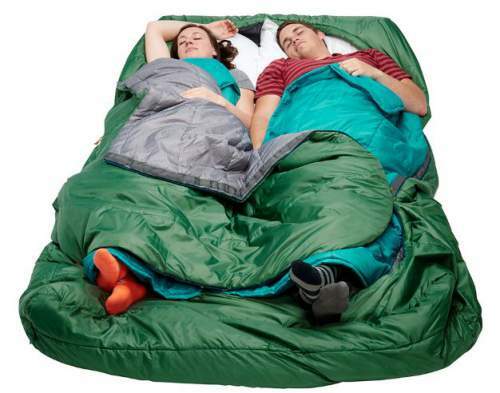 This double sleeping bag is a perfect tool for couples, for mothers with small kids, and for people who feel claustrophobic in an ordinary single bag (I am one of these, every bag is too small for me). The picture below shows that it really provides enough space for two people. The bag with both layers used – this is a configuration for a cold environment. Observe the top zipper that goes all the way around. The temperature rating for this bag is 20° F (-7° C), for a comfort you should add some 5 or 10 degrees, so clearly it may be good even in winter conditions. 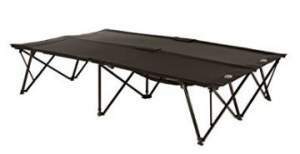 The length is such that it fits people up to 6 ft 6 in (198 cm), so this is reasonable as you will see in the comparison table below. Now, the weight is 9 lb 8 oz (4.314 kg), so this may look a lot, but again, from the table below you will realize that this is quite a normal weight. Clearly, this is not a bag to carry in the backpack, but it is very suitable for any outdoor activity where this is not the case, i.e., when you transport it in the car, on a motorbike, in a kayak, etc. The two layers allow for a better temperature regulation and comfort. The participants can use them at will. The mentioned two-layer design is a unique Kelty’s invention used also in some other bags, see for example this single bag for women form the same Tru.Comfort series. 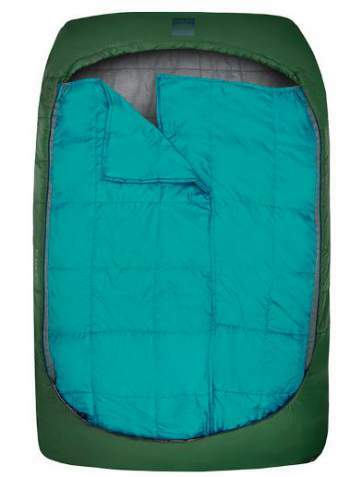 This means that you can unzip the upper layer and use only these blankets in a relatively warm environment. This is the bag without the top later – only internal blankets are used here. The mentioned oversized hood meaning is that you have enough space for two standard home pillows, while you can still cinch the hood around and be protected from the cold. The bag is heavy, but this is not a hiking or backpacking tool so I would not stress about it. The current price for this bag is $180, please follow the links for updates. You will see from the comparison table below that this is a reasonable price for such a bag. Weight: 9 lb 8 oz (4.314 kg). Fill weight: 103 oz (2.93 kg). Fits to: 6 ft 6 in (198 cm). Stuffed size: 28 x 15.5 in (71 x 39 cm). Shell: 75D 210T high filament poly taffeta. Liner: 75D 210T poly taffeta. *Note, this is a bottomless design, hence the weight. See more in the link. The prices at the moment of writing this text are, respectively, $180, 250, 412. Please follow the links to see more. In conclusion, I would stress that comfort is the strongest feature of this bag. 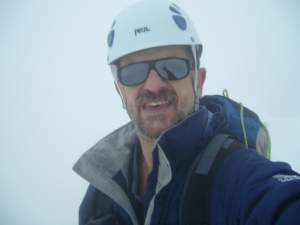 It also comes with some unique features which really add a lot to its functionality, so you can use it in all seasons, with and without the top layer. The packed size is not so great, this is obvious, but you will not carry it around so this is not a big deal. I can fully recommend this bag. Note that there are many double size bags presented in my separate text so please have a look. Check also these completely new models that appeared in 2018, the Sierra Designs Frontcountry Bed 35 Degree Duo and the Nemo Jazz Duo 20-Degree Sleeping Bag. If you need a single bag, have a look here. You might need a double pad that fits this bag, so here is the Kelty Tru.Comfort Double Pad from the same “Tru.Comfort” series. Thank you for reading. Please let me know if you have a question or comment, there is a comment box below. Have a nice day.